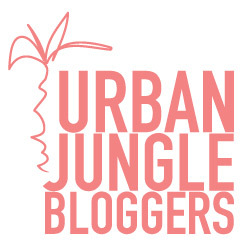 Summer is finally here and Urban Jungle Bloggers all over are celebrating summer with colour. We are doing this by making our plants pop! I decided to celebrate this with my Veldt Grape plant (Cissus quandrangularis) against a yellow background (wrapping paper). I have had this plant for a few weeks now and it is actively growing. I tried to find information about how to care for this plant, but information was very scarce. I am keeping it in a north facing window which gets about 4 hours of sun a day in the summer. Since it has succulent stems, I treat it like a succulent and water it sparingly. As I mentioned previously, this plant is very popular with body builders as it can increase muscle mass. There are also claims that it is used to treat diabetes, obesity, heart diesase, high cholesterol, bone fractures, osteoporosis, ulcer, pain…. even hemmorrhoids!! Hmm, it sounds like a “Cure-all” plant. Aaaaanywaayyy!! 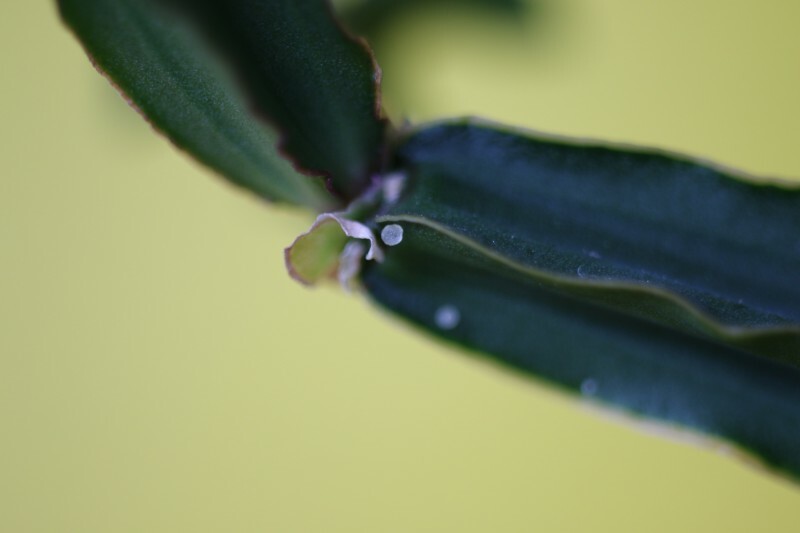 As I was taking pictures of the plant, I noticed something weird on the underside of some of the leaves and at the internodes. They looked liked tiny water droplets, but when I touched them with a skewer they just fell off. Up close they look like little gel beads that would be soft and squishy to touch. Do you know what they are? At first I thought they were eggs of some pest. After frantically searching on the internet, I am even more confused from the lack of information. My houseplant books were unfortunately no help either. Could it be due to edema? My best guess is that it is dried sap from the plant. 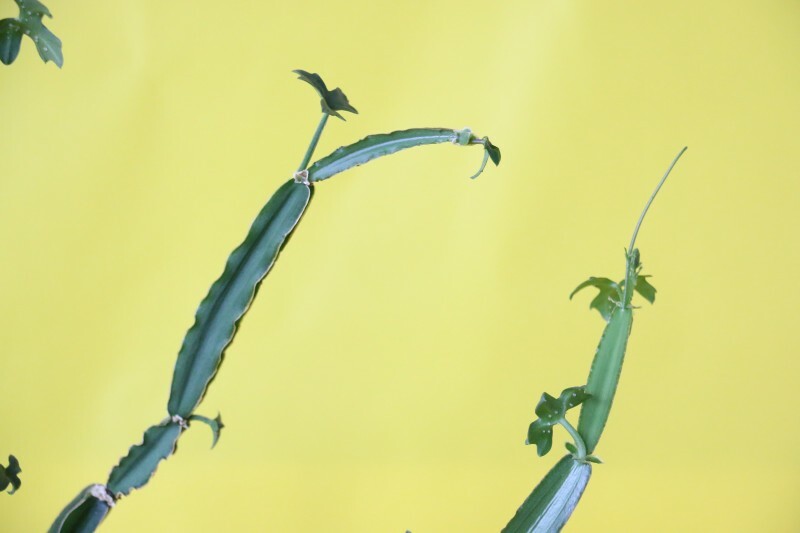 Apparently this phenomenon is common in okro (okra) plants. 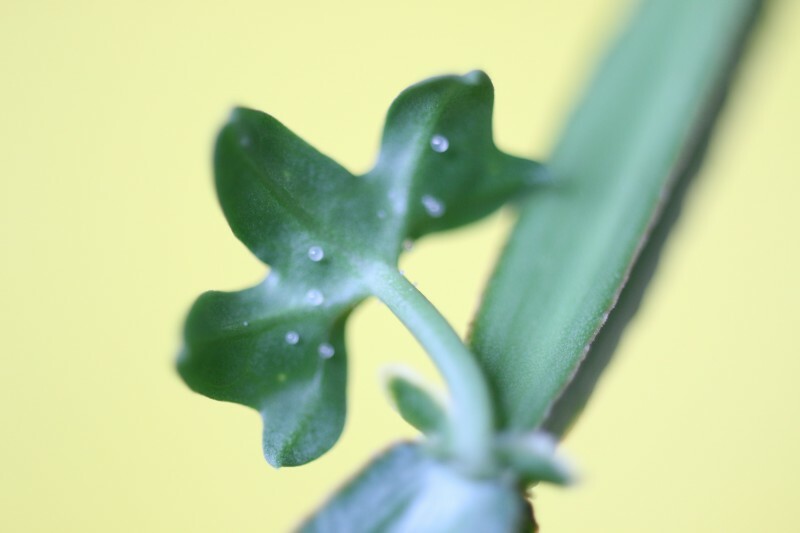 The most interesting thing I find about this plant, is its four- sided angular stems. I love how the whole plant and especially its angular stems looks against the yellow background. What a beauty! 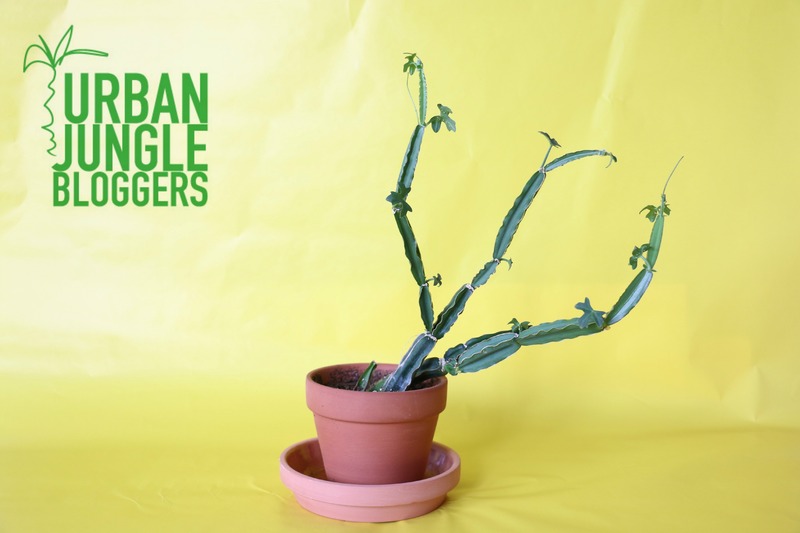 Why don’t you head on over to the Urban Jungle Bloggers website for more colourful plant displays?! Until the next green obsession, have a great weekend! 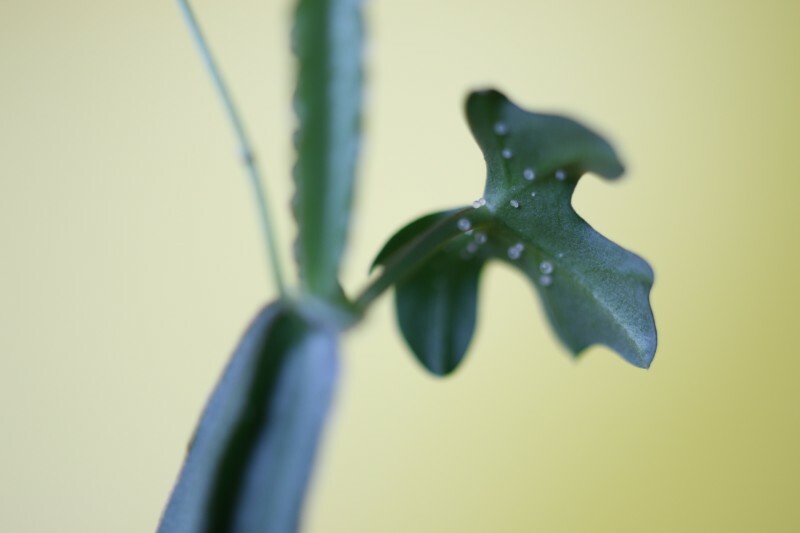 It looks like you have a cissus cactiformis! Oh yeah. Didn’t know that one even existed until you mentioned it. I can’t seem to differentiate the two from looking at pictures online. Any tips on how to is welcome. Cute plant. The yellow brings it out. Wrapping paper as a background is a great idea! This plant is new to me as are the little balls on the leaves. Very interesting indeed! I think it’s one of the odd plants I have. I’ve had to stake them a bit upright since this post. I like that I get to witness how it grows. Wow, those little “balls” are intriguing indeed! 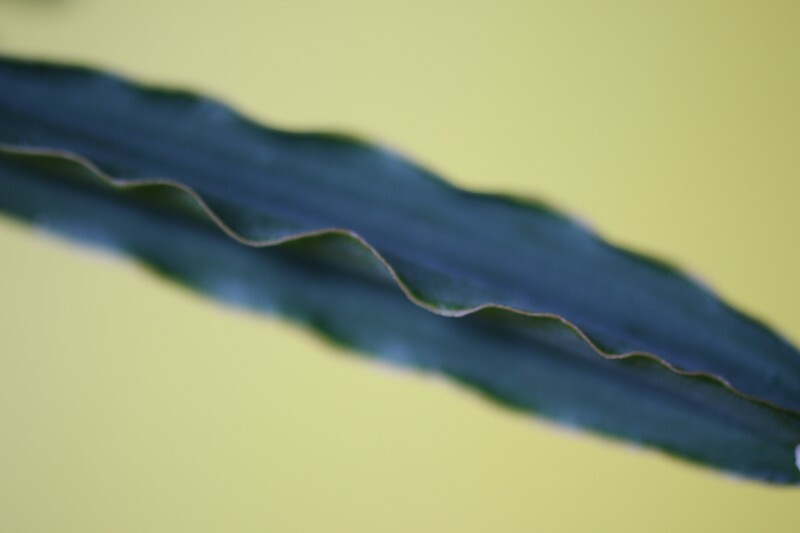 I’d guess it’s dried sap as well… I think I need to get myself a plant, as it seems like a wonder-plant 😉 But above all it looks really good, especially against your wrapping paper backdrop 😉 Thank you for this beautiful #plantcolorpop, Barbara! Had fun joining in this month. Always intrigued what you and augur will come up with next. Yay for wrapping paper 🙂 What an amazing plant!